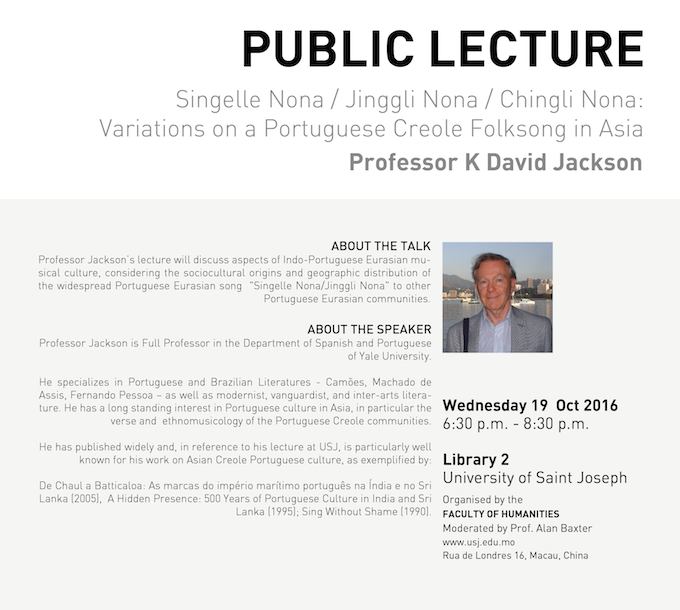 Public Lecture - Singelle Nona / Jinggli Nona / Chingli Nona: Variations on a Portuguese Creole Folksong in Asia by Faculty of Humanities on 19th October 2016 at Library 2, Nape 1, USJ. Professor Jackson’s lecture will discuss aspects of Indo-Portuguese Eurasian musical culture, considering the sociocultural origins and geographic distribution of the widespread Portuguese Eurasian song “Singelle Nona/Jinggli Nona” to other Portuguese Eurasian communities. Professor Jackson is Full Professor in the Department of Spanish and Portuguese of Yale University. He specializes in Portuguese and Brazilian Literatures – Camões, Machado de Assis, Fernando Pessoa – as well as modernist, vanguardist, and inter-arts literature. He has a long standing interest in Portuguese culture in Asia, in particular the verse and ethnomusicology of the Portuguese Creole communities. De Chaul a Batticaloa: As marcas do império marítimo português na Índia e no Sri Lanka (2005), A Hidden Presence: 500 Years of Portuguese Culture in India and Sri Lanka (1995); Sing Without Shame (1990).